The South Sudanese Civil War is an ongoing conflict in South Sudan between forces of the government and opposition forces. In December 2013, President Kiir accused his former deputy Riek Machar and ten others of attempting a coup d'état. Machar denied trying to start a coup and fled to lead the SPLM – in opposition (SPLM-IO). Fighting broke out between the Sudan People's Liberation Movement (SPLM) and SPLM-IO, igniting the civil war. Ugandan troops were deployed to fight alongside the South Sudanese government. The United Nations has peacekeepers in the country as part of the United Nations Mission in South Sudan (UNMISS). In January 2014 the first ceasefire agreement was reached. Fighting continued and would be followed by several more ceasefire agreements. Negotiations were mediated by "IGAD +" (which includes the eight regional nations called the Intergovernmental Authority on Development as well as the African Union, United Nations, China, the EU, USA, UK and Norway). A peace agreement known as the "Compromise Peace Agreement" was signed in August 2015. 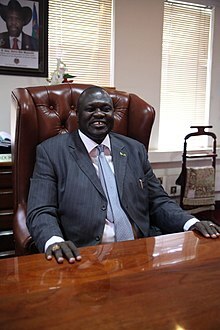 Machar returned to Juba in 2016 and was appointed vice president. Following a second breakout of fighting within Juba, the SPLM-IO fled to the surrounding and previously peaceful Equatoria region. Machar was replaced by Kiir as First Vice President by Taban Deng Gai, splitting the opposition, and rebel in-fighting has become of major part of the conflict. Rivalry among Dinka factions led by the President and Paul Malong Awan have also led to fighting. In August 2018, another power sharing agreement came into effect. About 400,000 people are estimated to have been killed in the war, including notable atrocities such as the 2014 Bentiu massacre. Although both men have supporters from across South Sudan's ethnic divides, subsequent fighting has had ethnic undertones. Kiir's Dinka ethnic group has been accused of attacking other ethnic groups and Machar's Nuer ethnic group has been accused of attacking the Dinka. More than 4 million people have been displaced, with about 1.8 million of those internally displaced, and about 2.5 million having fled to neighboring countries, especially Uganda and Sudan. Fighting in the agricultural heart in the south of the country has soared the number of people facing starvation to 6 million with famine breaking out in some areas. The country’s economy has also been devastated. According to the IMF, real income has halved since 2013 and inflation is more than 300% per annum.